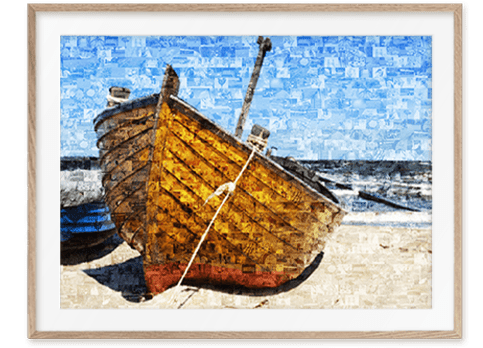 Mosaic Poster - with 1000 photos & 100% FREE delivery! What is a mosaic poster? 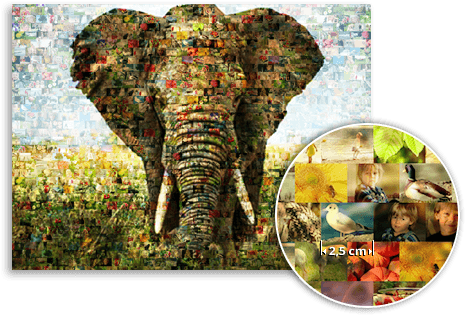 Everyone knows it: posters are the easiest and most inexpensive option for printing a photo mosaic in XXL. The mosaic poster will be printed with large format printers on special poster paper. The poster paper is manufactured by the Japanese company Fujifilm.The paper was especially developed for printing photos. Even fine details in the individual images are depicted. Which finishes are available for photo mosaic poster? The mosaic posters are available in two finishes: “glossy” or “silk matte”. Your choice does not affect the price of the mosaic poster.Glossy poster: The poster paper in a glossy finish is very stable thanks to a paper weight of 240 g/m2. The colours shine brightly on the shiny surface.ilk matte poster: The poster paper in a silk matte finish has a paper weight of 270 g/m2 and is even more stable than the glossy version. Due to the silk matte surface, the light reflection is reduced. The paper is especially suitable for art work.We use Epson Stylus Pro printing technology for our poster prints. 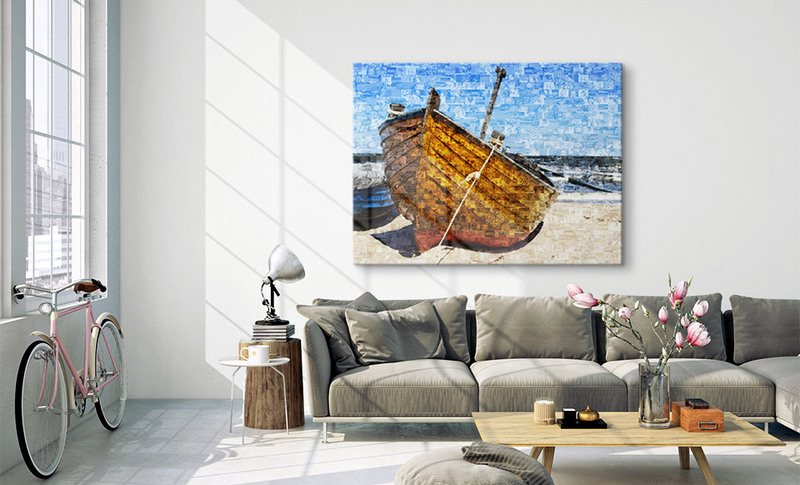 The photo mosaic posters are printed with a 11-color system with UltraChomeTM inks. We guarantee fade-proof colours for 75 years (indirect sunlight). You can be sure that your mosaic poster will look great and have bright colours for many, many years.After printing, cutting, drying and a quality check, your print mosaic poster will be wrapped in transport paper and packed with specially-made transport covers. Finally the finished product will be given to UPS to be shipped. Finished photo products are picked up multiple times daily to be shipped to our customers.Mosaic poster prints are always sent rolled. This ensures that your photo mosaic poster will arrive without any creases or folds. You will receive a shipping confirmation email when your information has been received by the logistics provider. In this automatic email you will receive a tracking code. With the tracking code you can follow your mosaic poster over the complete process of delivery. That way you can be sure that your package will arrive on time. This is especially important if you are planning on giving your photo mosaic poster as a present at a special event. 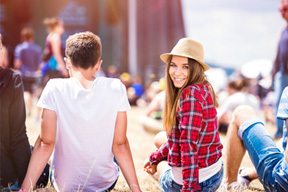 Tip: Use at least 100 photos. The more photos, the better the mosaic poster will be (max. 1000 photos). First of all, you upload your favourite photo as the main image. This will be the main motif. Now upload the many small photos. The more photos, the better. Your mosaic poster will now be printed. You can expect delivery in 1-3 days.